still survives at this Great Western station,just one stop from the terminus at London Paddington. Taken on 29nd November 2014. 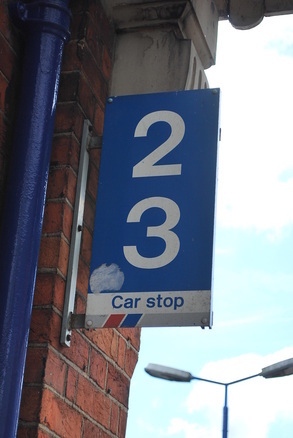 NSE branded '2/3/4 Car stop' sign at Acton Main Line station. This Station in Essex still has the sign installed by Network Southeast. colours in later years. Taken on 24th October 2015. Network SouthEast sign at Althorne Station. Information & Photo supplied by Joshua Sammons. 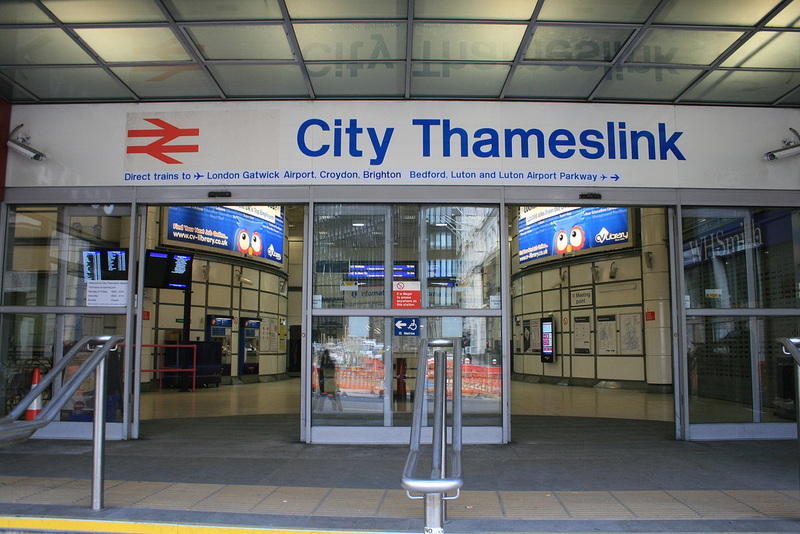 installed when the Class 165 'Chiltern Turbos' were introduced. Taken on 5th August 2014. 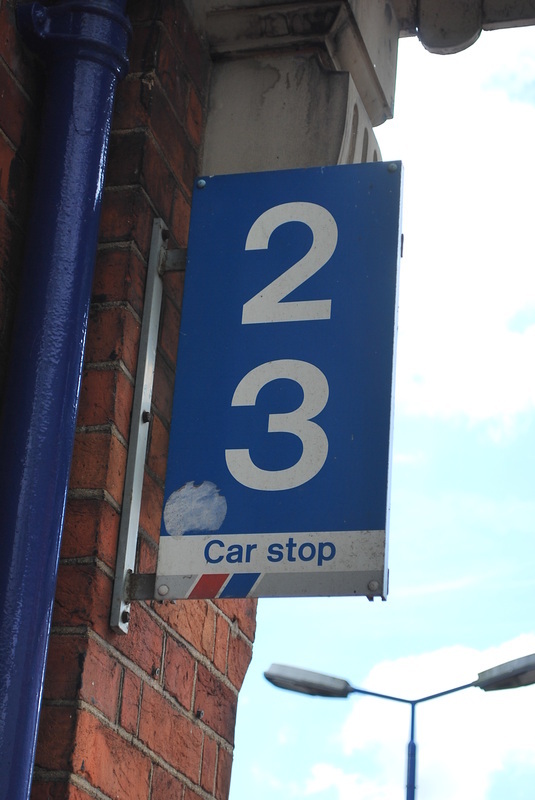 NSE branded 'S Car stop' sign at Amersham Station. 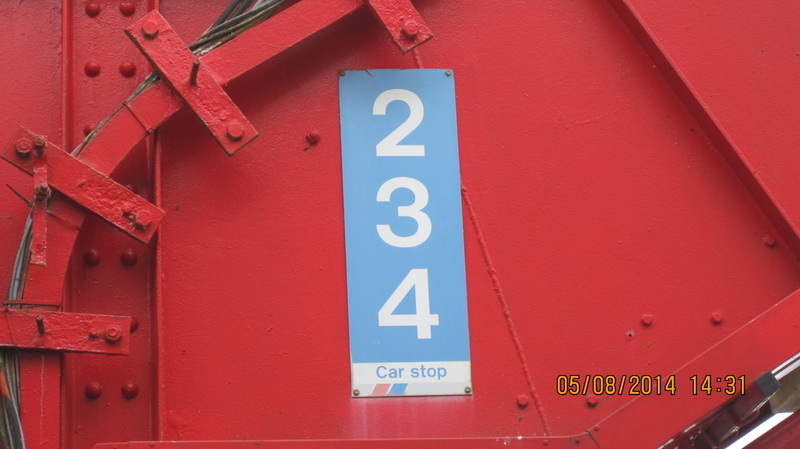 NSE branded '2 3 4 Car stop' sign at Amersham Station. Information & Photo supplied by Joell Fears-Caines. This 'S' Car Stop Sign is located on the Northbound platform at this Buckinghamshire Station. Taken on 17th July 2015. Reminders of Network SouthEast still remain at this 'Chiltern Line' Station in Buckinghamshire. Taken May 2014. 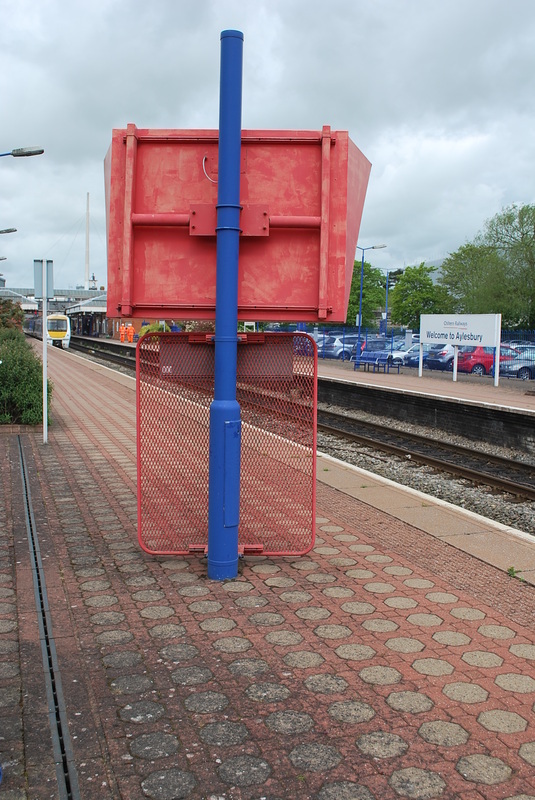 The DOO mirrors at Aylesbury Station are still in faded NSE red, ajacent to a 'Car stop' Marker (with NSE flash taped over). Rear of a DOO mirror at Aylesbury Station which is still in faded NSE red. NSE Branded '2/3 Car stop' Marker at Aylesbury Station. 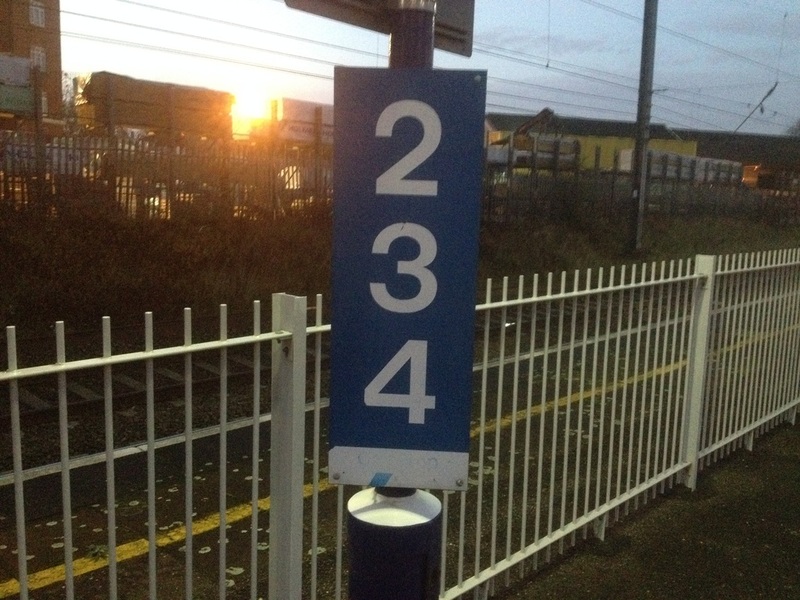 '4 Car stop' Marker (with NSE flash taped over), at Aylesbury Station. Information & Photos supplied by Ian Morrish. This Chiltern Line station still has an 'NSE Clock' , which is located at the top of the stairs towards the upper concourse. Taken on 17th June 2013. 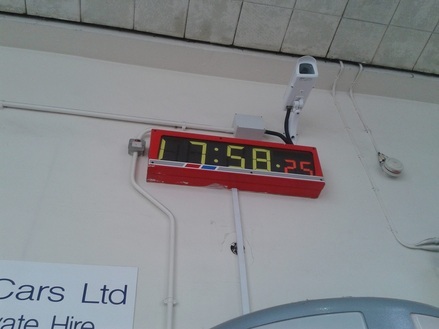 NSE Clock at Banbury Station. Information & Photo supplied by Remy Osman. 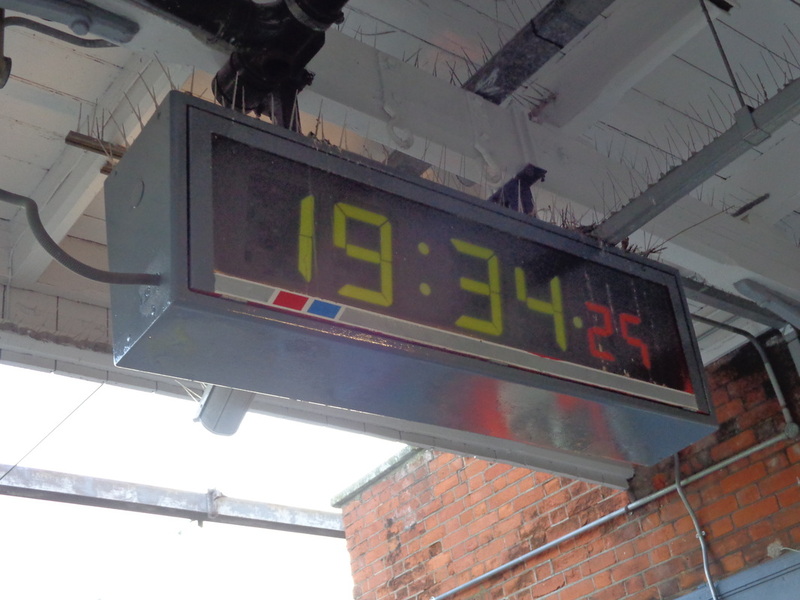 This Network SouthEast clock is still in place and fully working in 2015. Taken on 18th February 2015. Information & Photo supplied by Mark Hough. Evidence of Network SouthEast is still found at this Station. 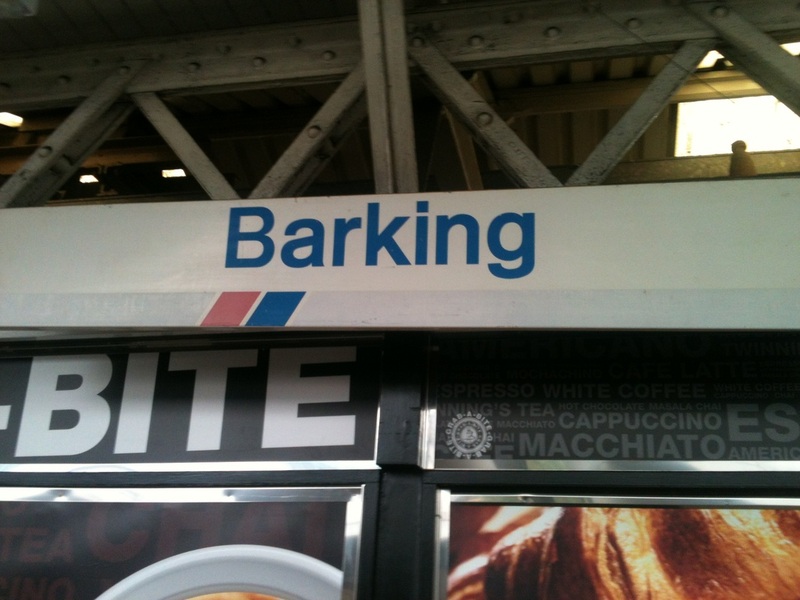 Barking Sign - Taken 15th April 2012 & Platform 8 Sign - Taken 27 December 2012. NSE Branded platform sign at Barking Station. 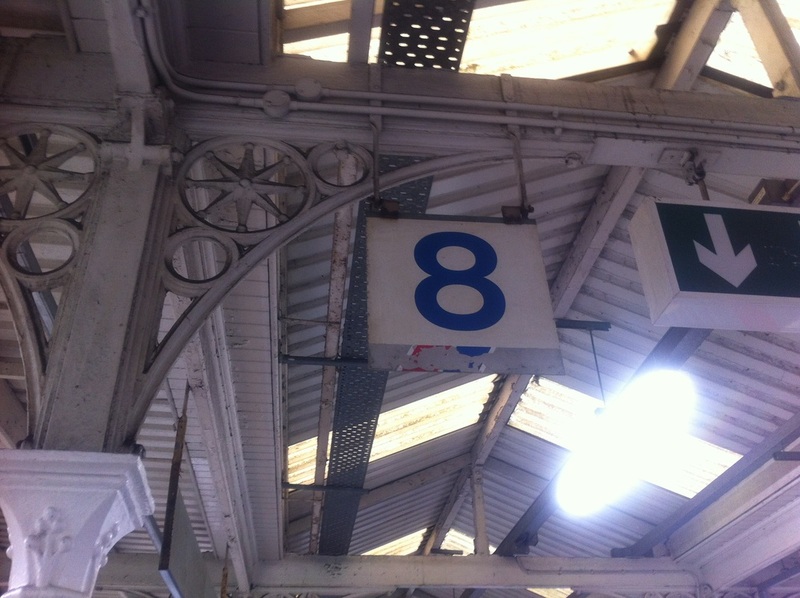 Barking Station Platform 8 sign. that were installed by Network SouthEast over 20 Years ago. Taken on 9th March 2013. 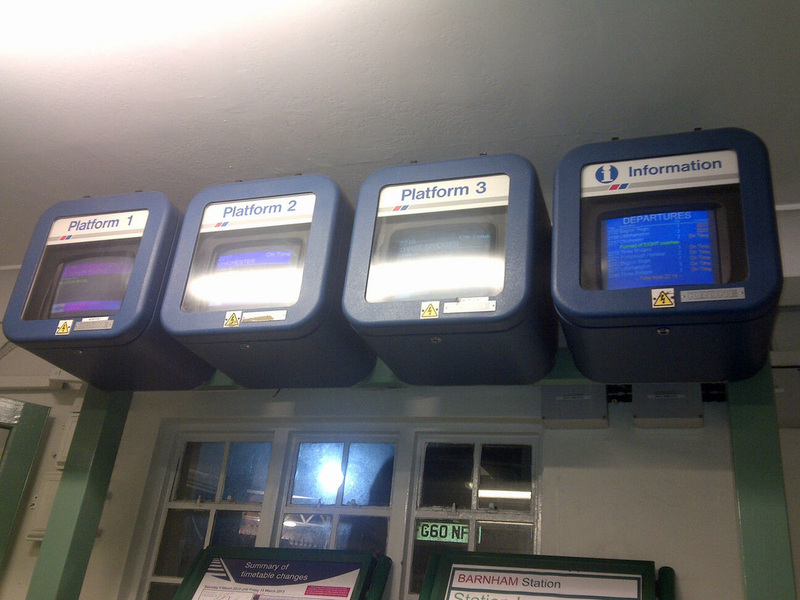 Barnham Station Information Display Monitors in Main Booking Hall. 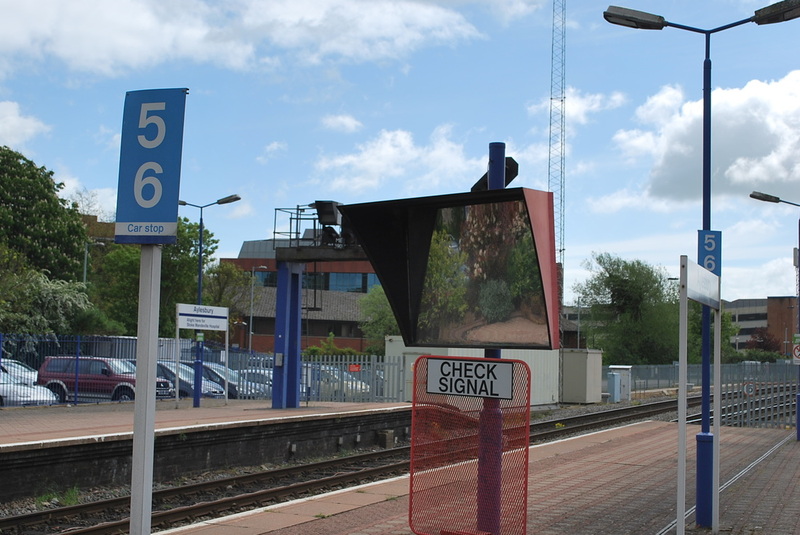 Barnham Station Information Display Monitor on Platforms 1 & 2. This wall mounted advertising board dates back from days of NSE, which is located on Platform 3 at this Hampshire Station. Not many of these around now. Taken on 22nd May 2014. 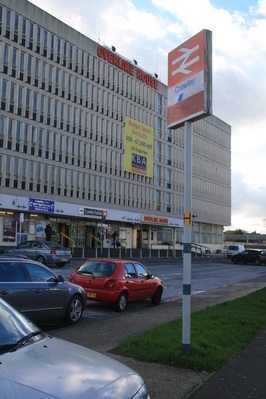 NSE branded advertising board on platform 3 at Basingstoke Station. Information & Photo supplied by Tim James. 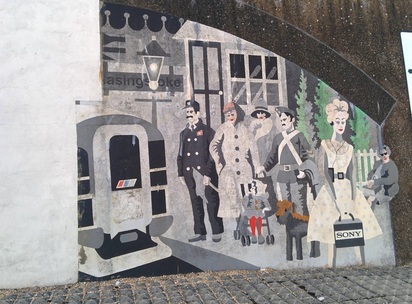 NSE mural on the railway bridge next to Basingstoke Station. 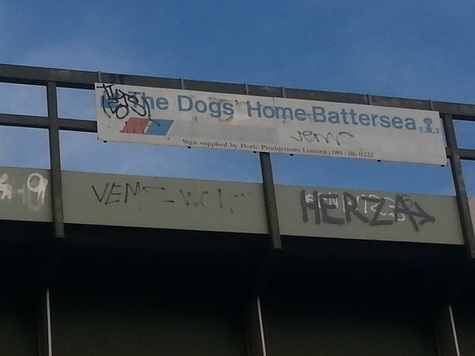 A little way out of the Station on the bridge that crosses Battersea Park Rd, a sign can be found giving direction to the local dogs home there. Taken on 13th September 2014. NSE branded 'The Dogs Home Battersea' just outside Battersea Park Station. Information & Photo supplied by Tyler Brace. warning passengers of the dangers of the stairs that lead up to the platforms and fast trains passing at speed on platform 5. Taken on 15th February 2015. NSE warning sign on stairs to platforms with branding covered up at Battersea Park Station. 'RED Portacabin' type building. These days the overall apparance the Ticket Office is a very faded and weathered 'RED'. Taken on 28th May 2014. 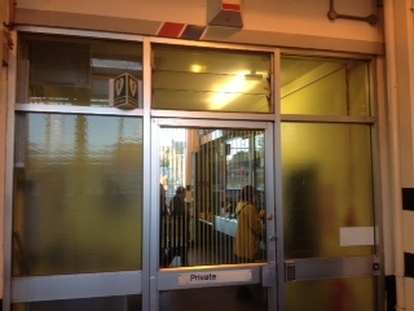 Network SouthEast 'RED' Ticket Office at Bedhampton Stataion. Information & Photo supplied by Matt Williams. 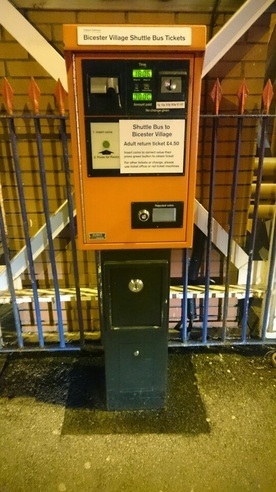 NSE PERTIS machine.It now sells tickets for local shuttle bus service to the local town which the station serves - Bicester. Taken on 29th January 2015. Former NSE PERTIS machine - now issuing bus tickets at Bicester Station. Information & Photo supplied by Neil Bird. 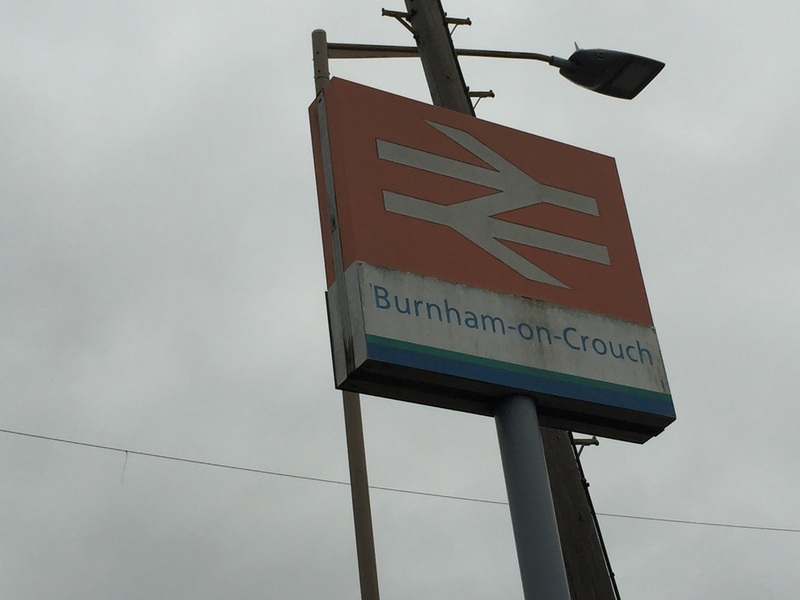 Network Southeast's former presence can still be felt at this Essex Station. 'click clack' clock is still present. Taken on 24th October 2015. Network SouthEast' block paving and clock at Billericay Station. over the flash, so is no longer on view. Taken on 4th May 2015. 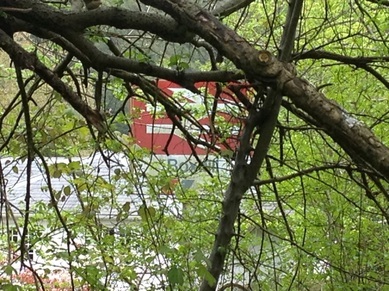 Network SouthEast branded sign on rear at Boxhill Station. Information & Photo supplied by Ian Jones. 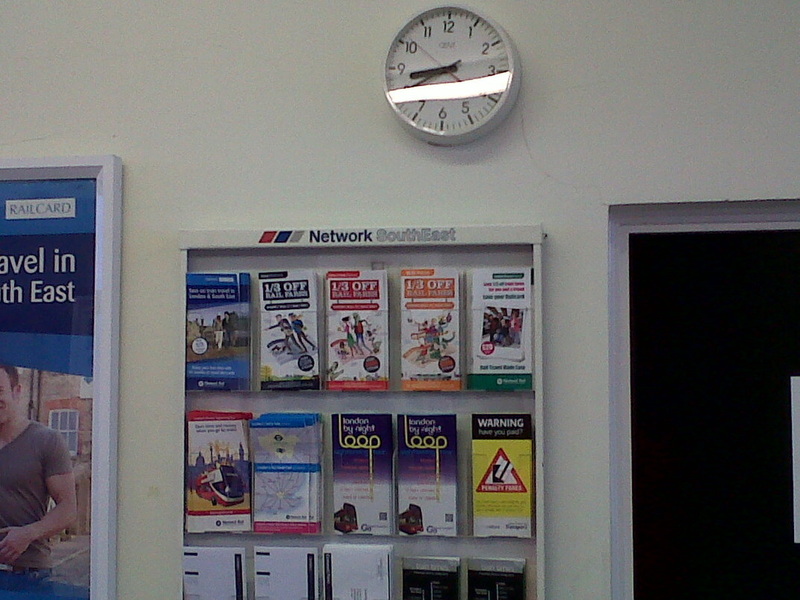 an Network SouthEast clock still appears here- although sadly not working. Taken on 20th June 2015. 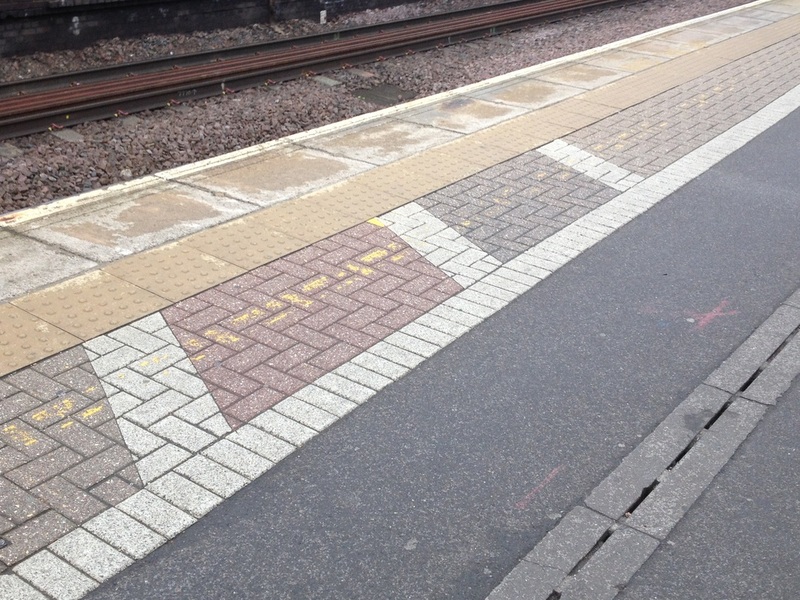 Network SouthEast block paving at Brentwood Station. 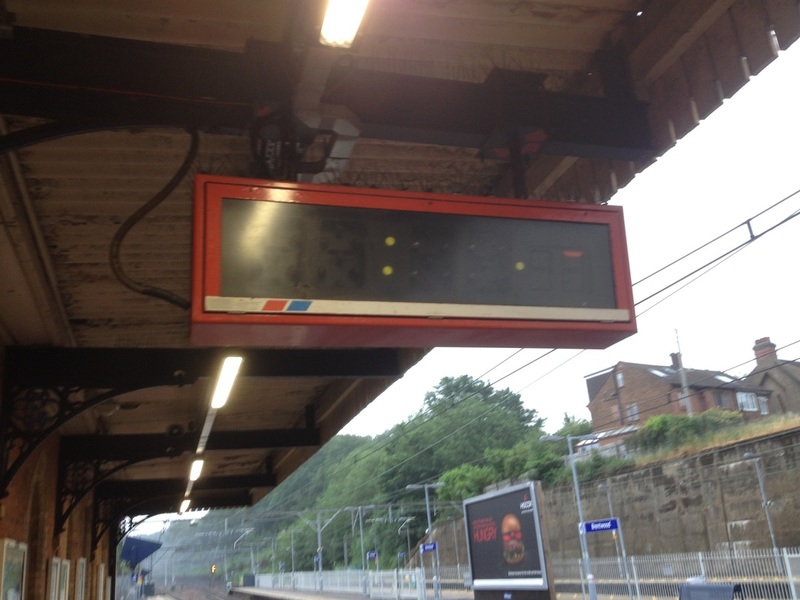 Network SouthEast 'Click Clack' clock at Brentwood Station. 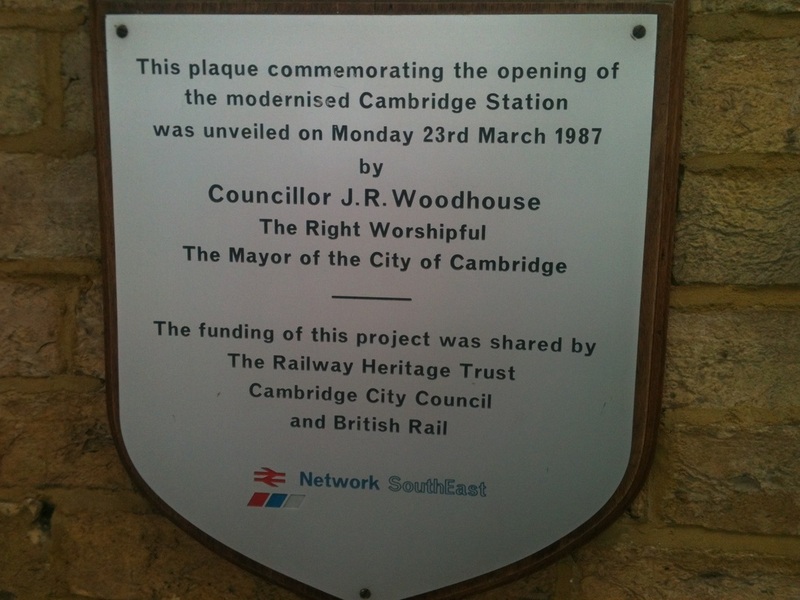 This plaque is located on the East side of the main station building. Taken on 24th December 2012. 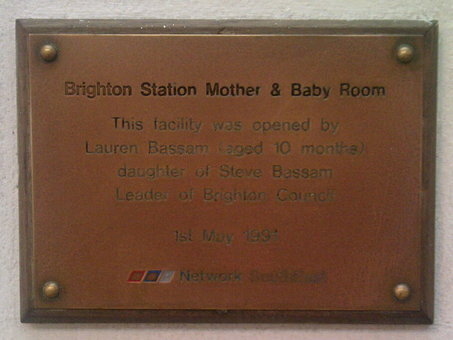 Brighton Station Mother & Baby Room Plaque. Although no longer working, the NSE Solari indicator is still in place. The new LED system is now mounted onto the framework. Taken on 17th Jan 2013. 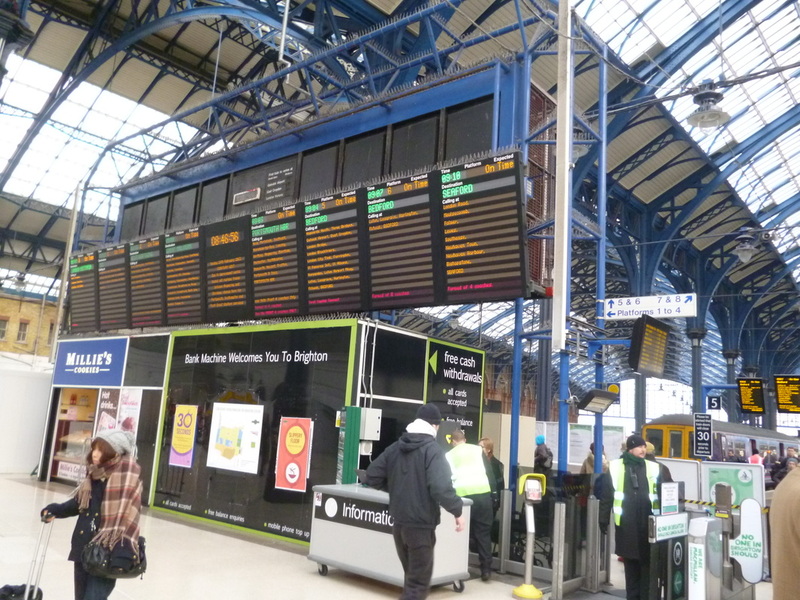 Brighton Station NSE Departures Board. 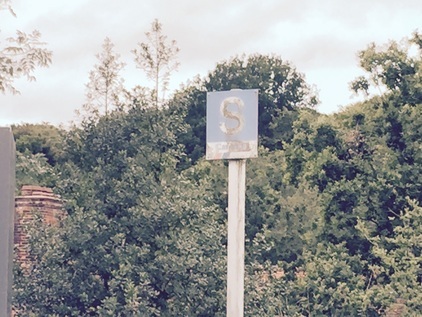 This Sussex Coast Station still has a Network SouthEast/Red Star Sign still in a place. 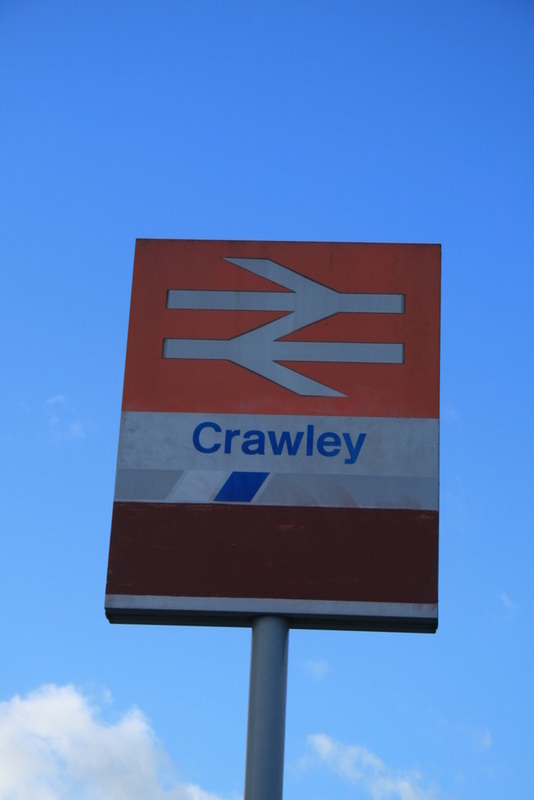 The sign is located on the side wall of the station building on Terminus Road. Taken on 11th May 2015. 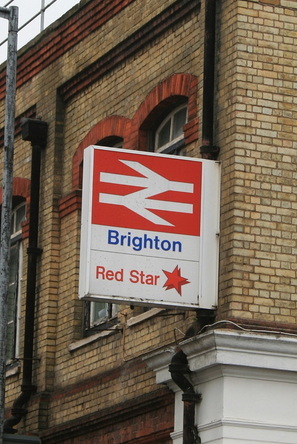 Network SouthEast/Red Star sign at Brighton Station. Information & Photo supplied by John Chisholm. 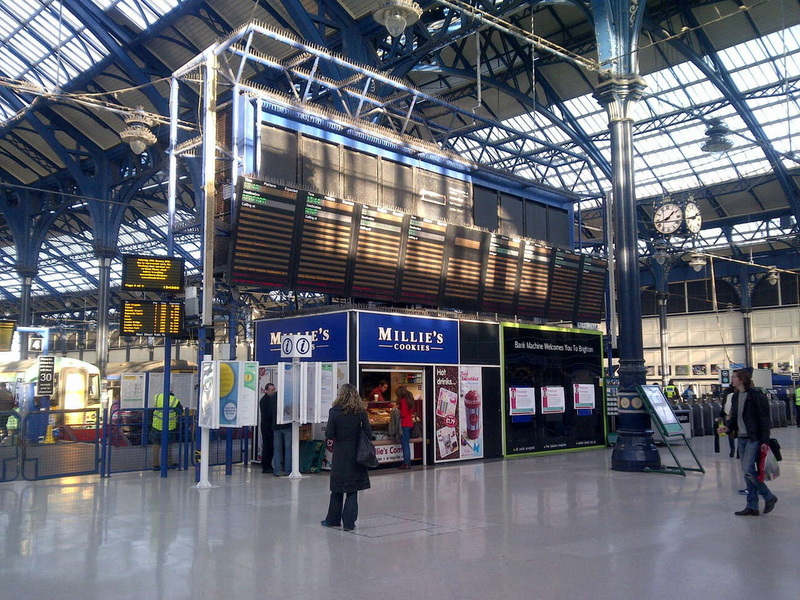 At the end of 2012, it came to the attention of Neil Bird that the Solari Train Indicator Board at Brighton Station was to be demolished as part of the station improvements taking place to enhance the view of the train shed from the concourse. 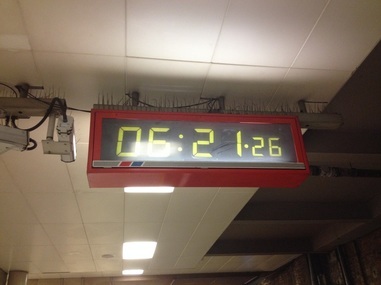 The board was erected during the NSE era and we understand that this is the very last Solari in existence in the UK. It was agreed by the committee that we should do everything possible to secure the complete unit together with the associated control equipment. Approaches were made to Southern Railway, Network Rail, Heritage Railway Association and the NRM York, to establish if there was any interest in saving this last survivor for the nation. The NRM have already acquired a section from another location advising us that they had no plans for the complete Brighton assembly. Network Rail and Heritage Railway Association also confirmed that they had no plans to recover the unit. 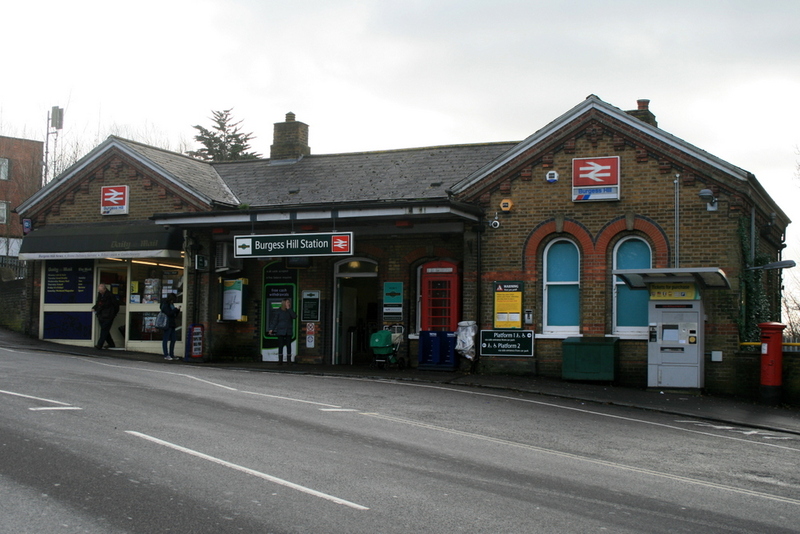 So it was down to us and Southern Railway to negotiate a way in which we could be involved in the removal and acquisition of the whole Board with the intention of returning it to working order. Solari Framework with LED board mounted on it. Taken by Chris Osman. 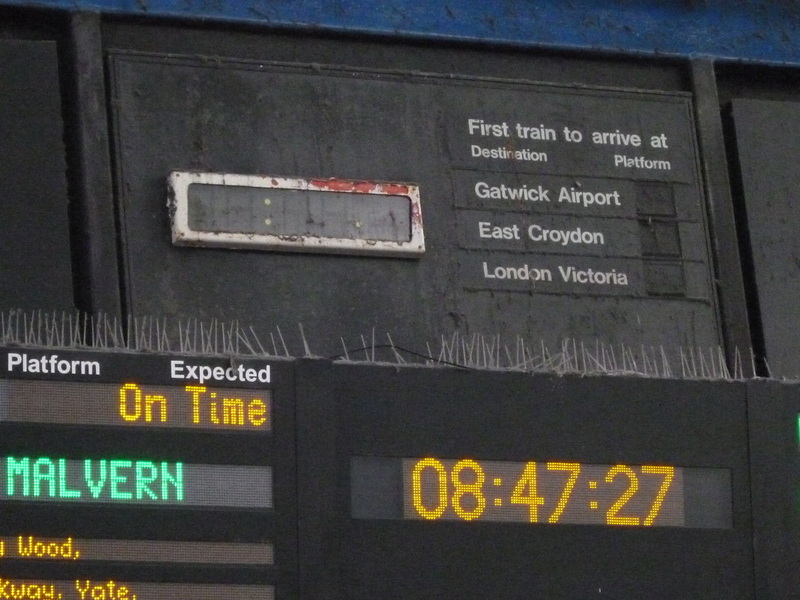 Centre of Solari board with NSE clock & 'First' trains to arrive info. Chris Osman. 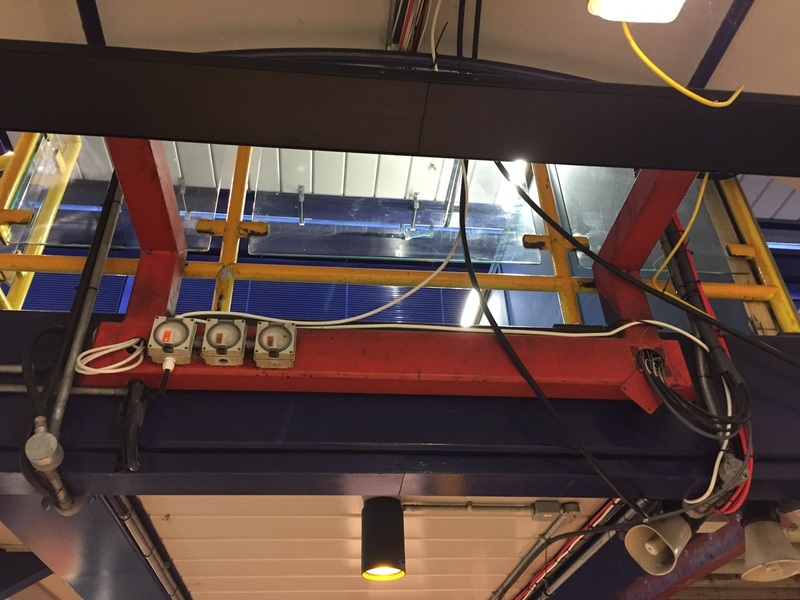 In due course, Neil Bird and Chris Osman met up with the project team at Brighton who gave us the opportunity to inspect the gantry and fittings. During our discussion we raised the issue of the control equipment located elsewhere on the station. 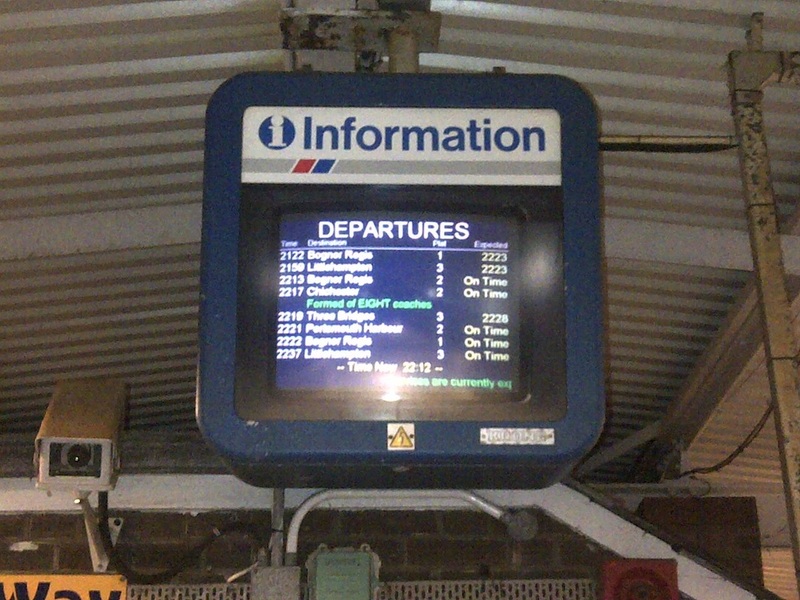 On arriving at the office, we were dismayed to find that the control unit, a computer and programme, had been taken out at the time the board was decommissioned, being replaced by the dot matrix units visible in the picture, and scrapped. If anyone knows of any control equipment from another location which may be donated to the society, please contact Chris Osman or Neil Bird. A decision was taken to salvage 5 of the 8 displays along with the associated infrastructure. The other three displays had been cannibalised or removed. The date for dismantling was set for the beginning of May. Due to circumstances beyond our control, the recovery date was put back until the 2nd June when we were told that the main part of the display was down and ready for collection. Thanks to Neil and NY Haulage, collection took place on Monday 3rd June with the bulk of the display boards now safely stored at our depot in Shoreham. It is expected that the gantry will be dismantled in the next few days (after 6th June) when it will be reunited with the display units at Shoreham. Inside the gantry of the Solari board. Taken by Neil Bird. 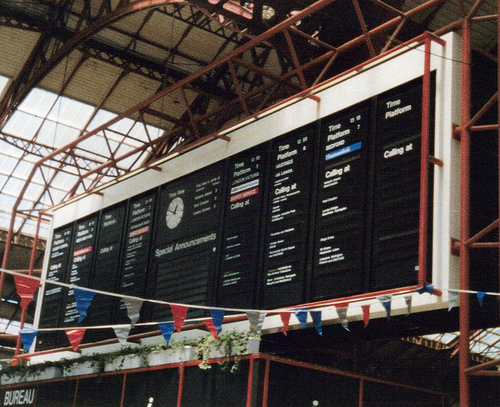 The Solari board during the NSE era. Taken on 10th June 1989 by Kevin(elkemasa). Julie Boyle, Chris Griffiths and other Project members who have gone out of their way to make all of this happen. We look forward to continuing our good relationship with Southern Railway. This West Sussex station still has two Network SouthEast signs ouside of it, located on both sides of the main entrance. Taken on 10th February 2014. Burgess Hill Station entrance featuring 2 NSE signs. colours in later years. 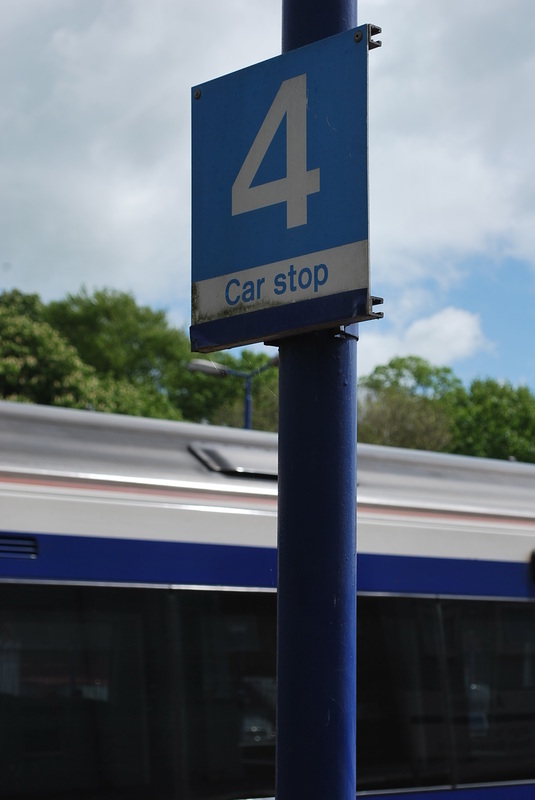 Also in place here are 'NSE car stop' signs on the platforms. Taken on 24th October 2015. Network SouthEast sign at Burnham-on-Crouch Station. 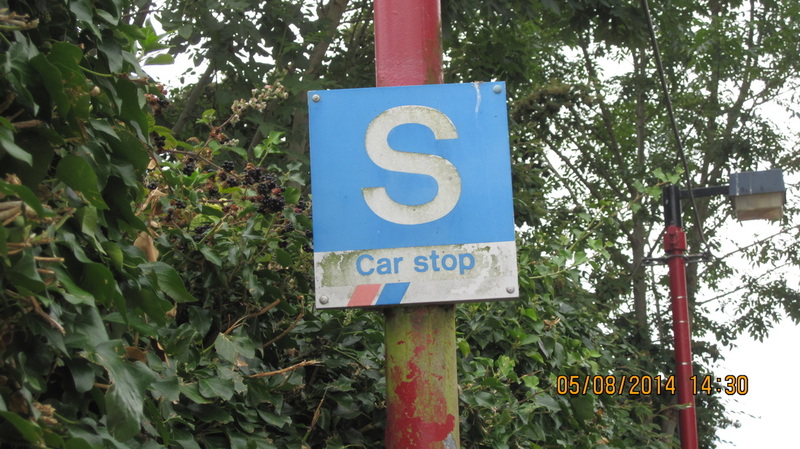 NSE 'S Car stop' sign at Burnham-on-Crouch Station towards Southminister. 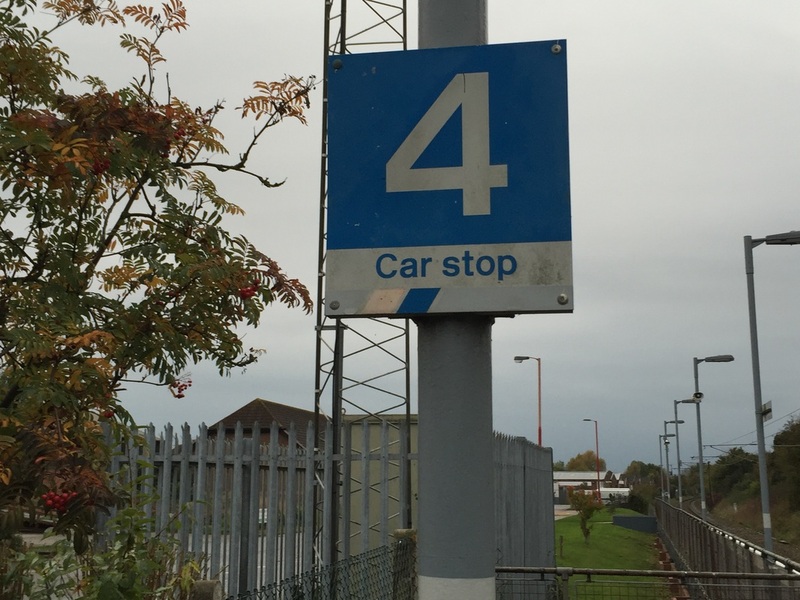 NSE '4 Car stop' sign at Burnham-on-Crouch Station towards Wickford. 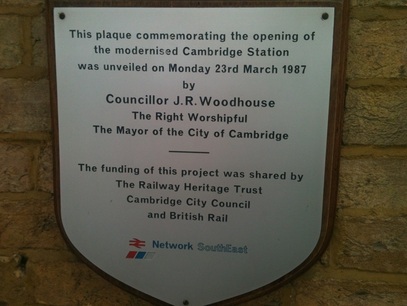 Plaque to mark the upgrading of this station in 1987. Taken on 12th June 2012. Information & Photo supplied by Lee Spenceley. 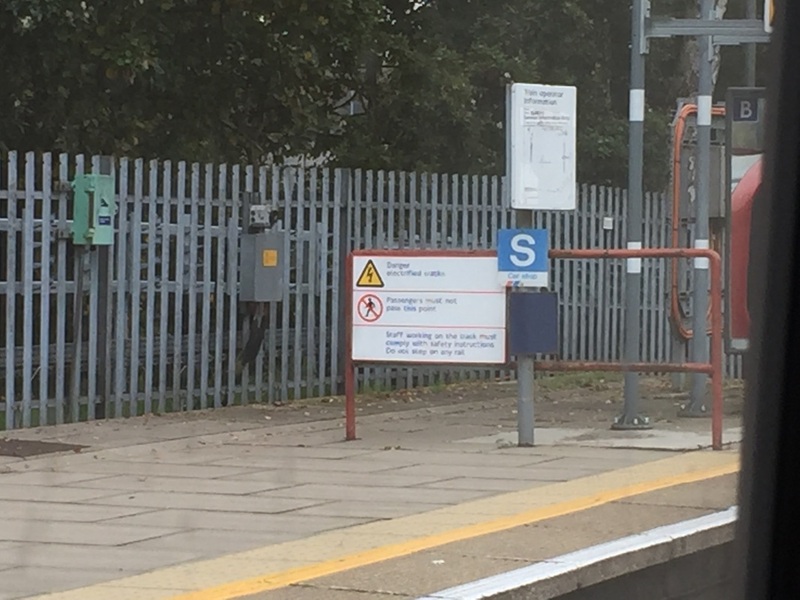 This Chiltern Line / LU Metropolitan Line Station still has a Network SouthEast 'S Car stop' sign at the end of platform. Taken on 4th November 2015. 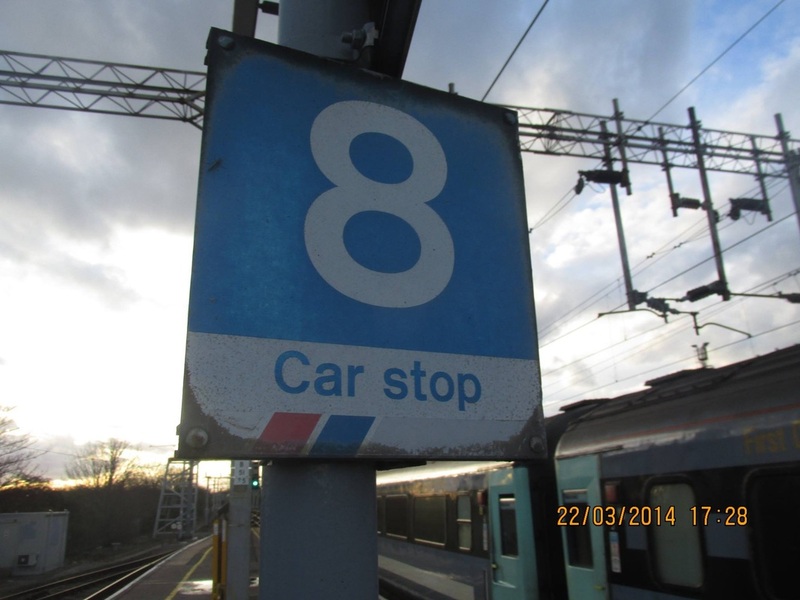 Network SouthEast 'S Car stop' sign at Chalfont & Latimer Station. 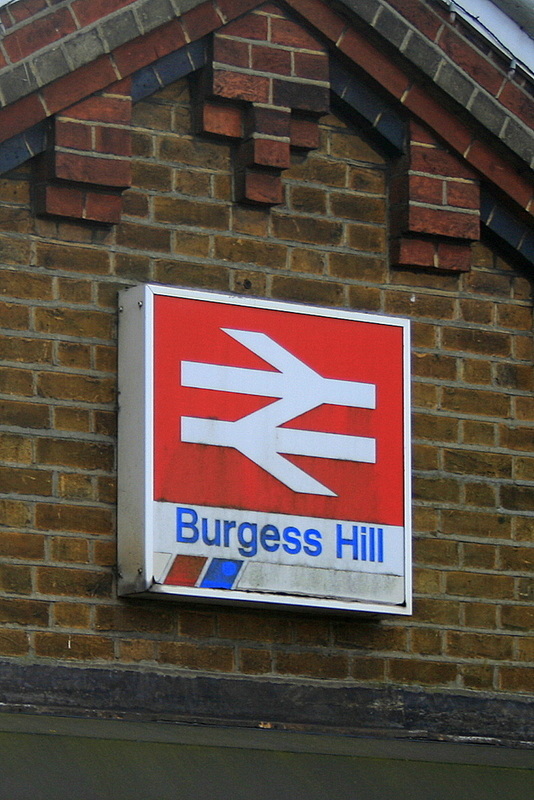 This NSE branded sign is still present at this Essex Station. 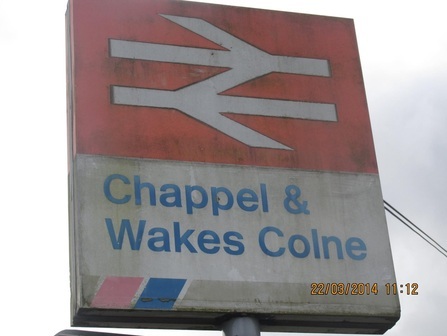 Chappel & Wakes Colne Station sign. 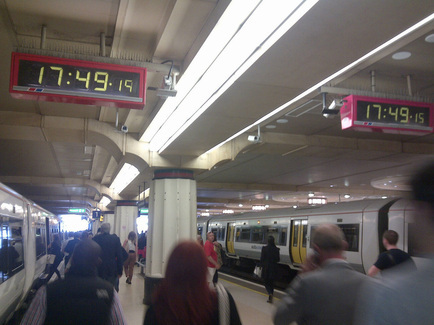 NSE Clocks still click away at the London Terminus, shown here on Platforms 1 & 2. Taken on 1st July 2013. 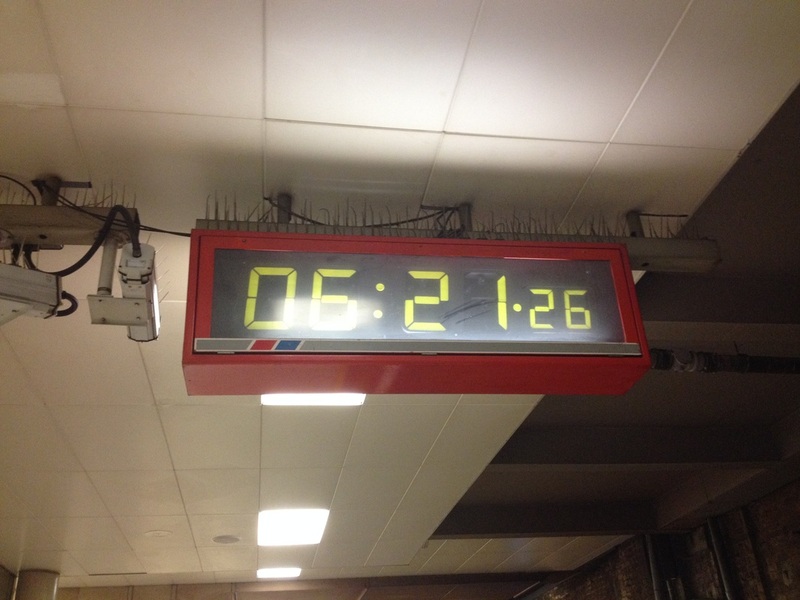 NSE clock still in full working order on Platform 6 at Charing Cross Station. Taken on 22nd March 1015. Network SouthEast still in use on Platform 6 at Charing Cross Station. Network SouthEast commerative plaque to mark station improvements. Taken on 11th April 2015. 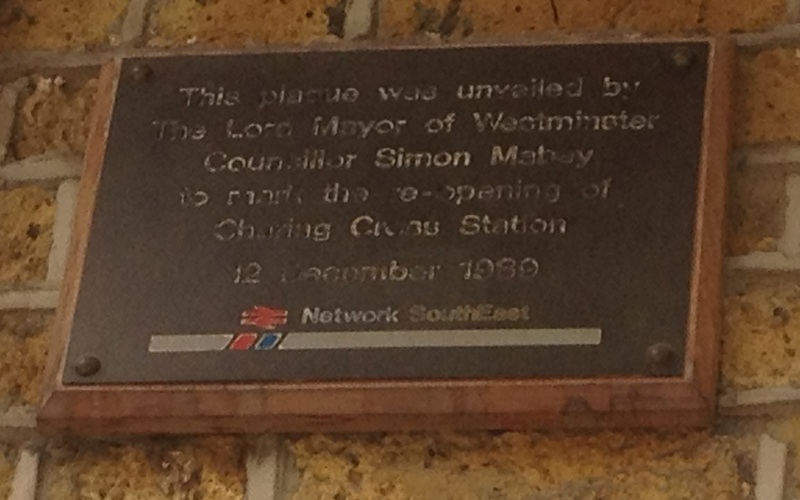 NSE plaque to mark the reopening of Charing Cross Station in 1989.
at this station. Taken on 14th January 2013. 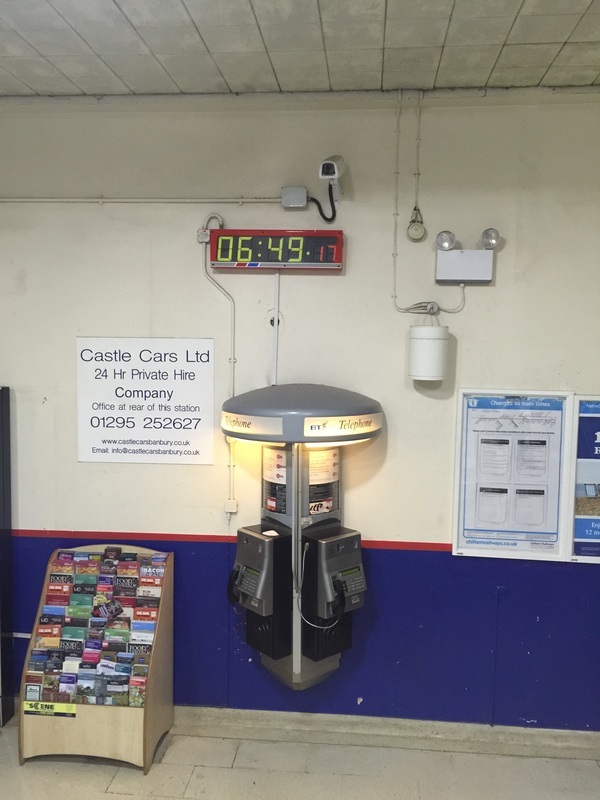 Cheddington Station Booking Office NSE branded leaflet holder. 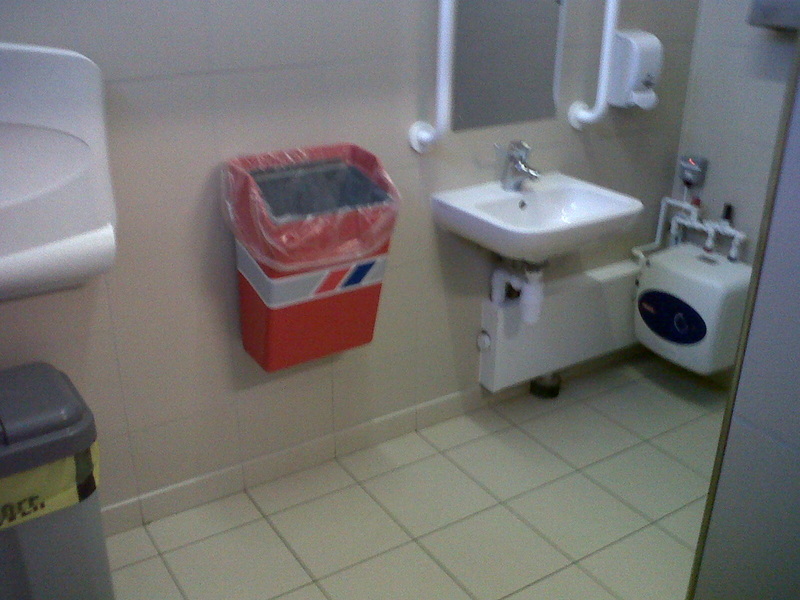 Cheddington Station NSE branded litter bin in washrooms. Information & Photos supplied by Charley Ashbury. 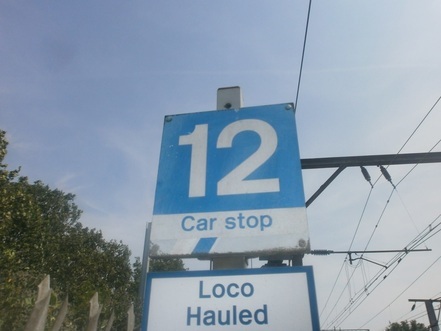 This Great Eastern Line station still has an NSE branded 'Car stop' sign. Taken on 22nd July 2013. 12 Car stop Sign at Chelmsford Station. and was not easy to see at first.Taken on 25th October 2014. 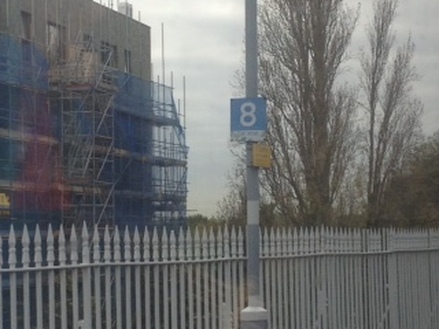 8 Car stop Sign at Colchester Station. This Essex Station still displays a BR/Network SouthEast sign outside the Station and also 'RED - Network SouthEast' paintwork can be seen on the worn handrails which lead down to the platforms, which have been repainted yellow in recent years. Taken on 20th June 2015. 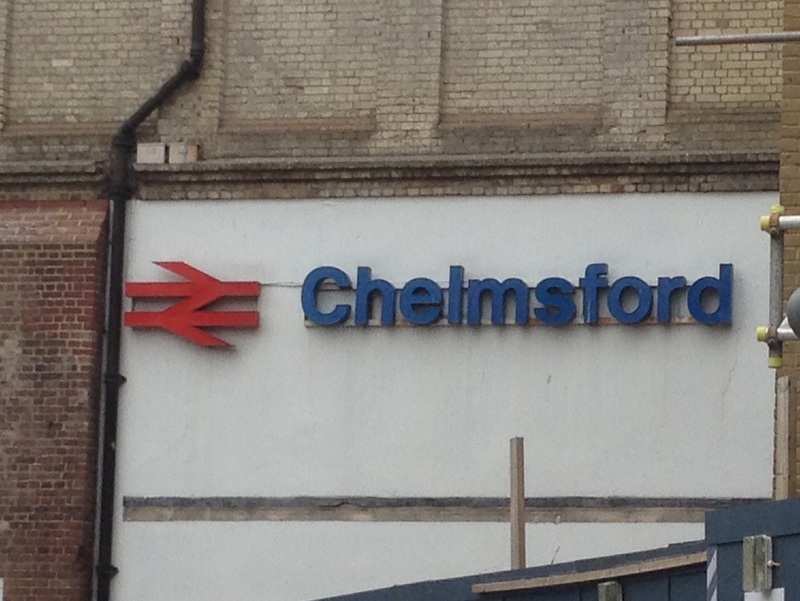 BR/Network SouthEast sign at Chelmsford Station. 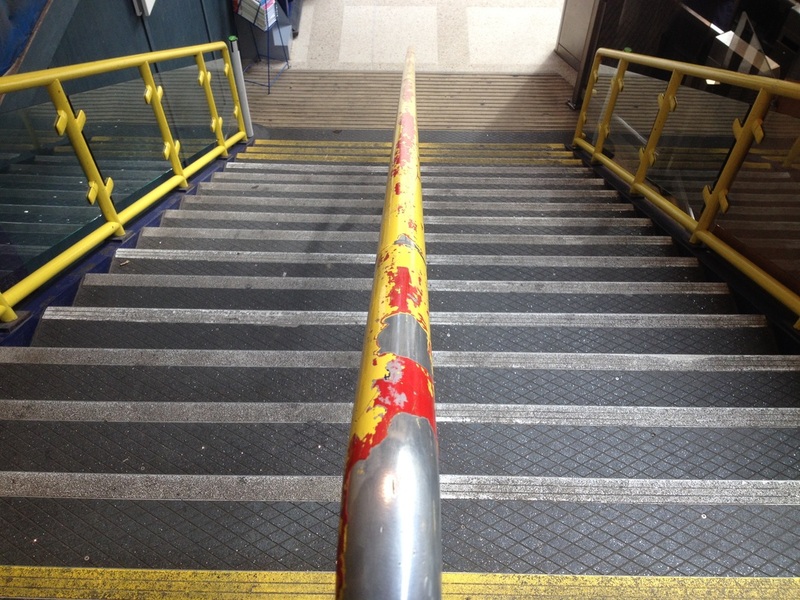 Network SouthEast 'RED' paint revealed at Chelmsford Station. 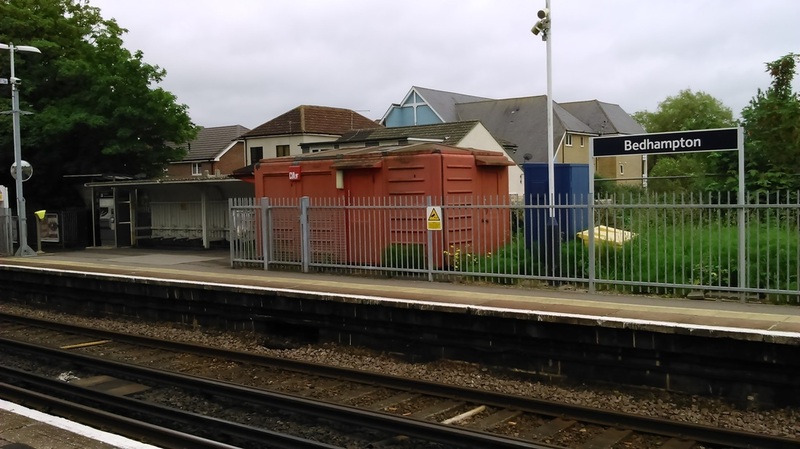 This Station also has 'RED - Network SouthEast' paintwork on the exterior of the building on the framework of the glazed roof and on a roller shutter door. Within the Station, reminders of NSE paint can be seen on the electrical cable housing framework. Taken on 21st November 2015. 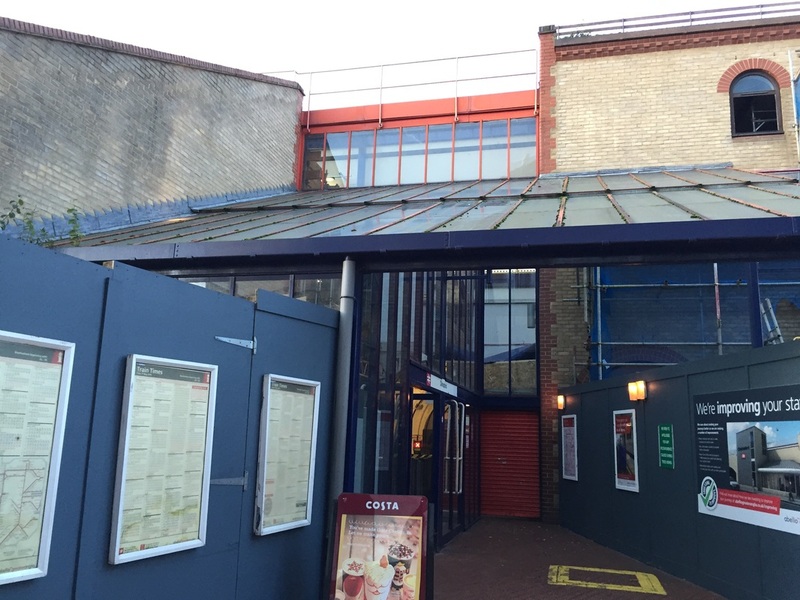 Exterior of Chelmsford Station showing NSE 'Red' paintwork on roof and door. 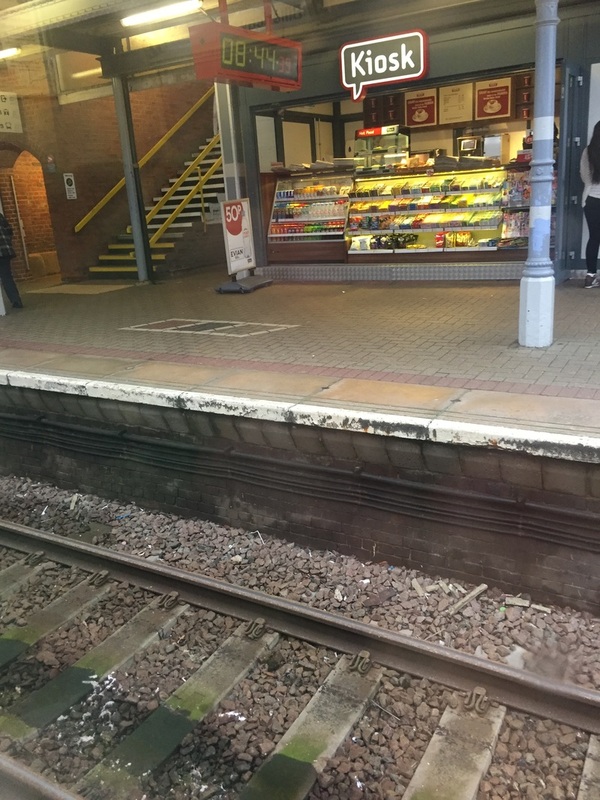 Interior of Chelmsford Station showing NSE 'Red' paintwork on cable housing. Information by Joshua Cooper & Photo supplied by Joshua Sammons. 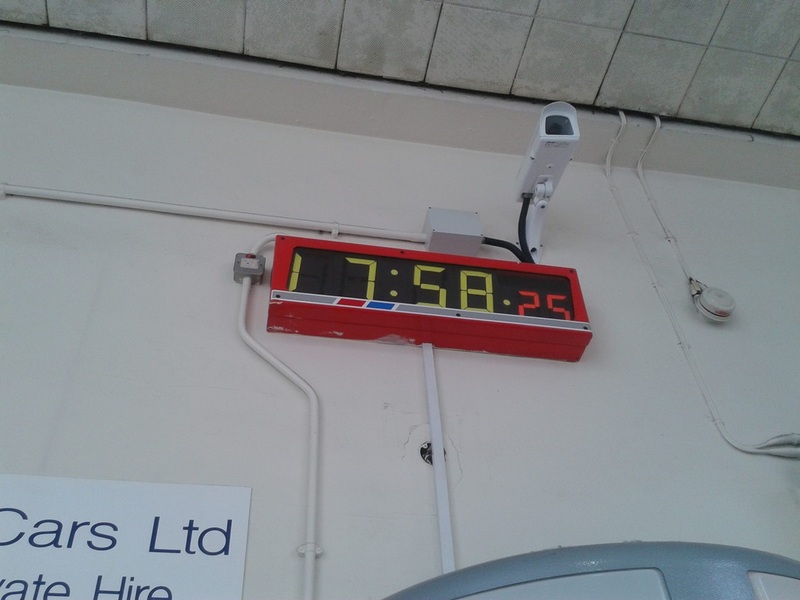 This NSE clock is located on Platform 1 at this Essex station. The reverse side has had its NSE stripes removed. Taken on 26th August 2013. Chingford Station NSE clock on Platform 1. 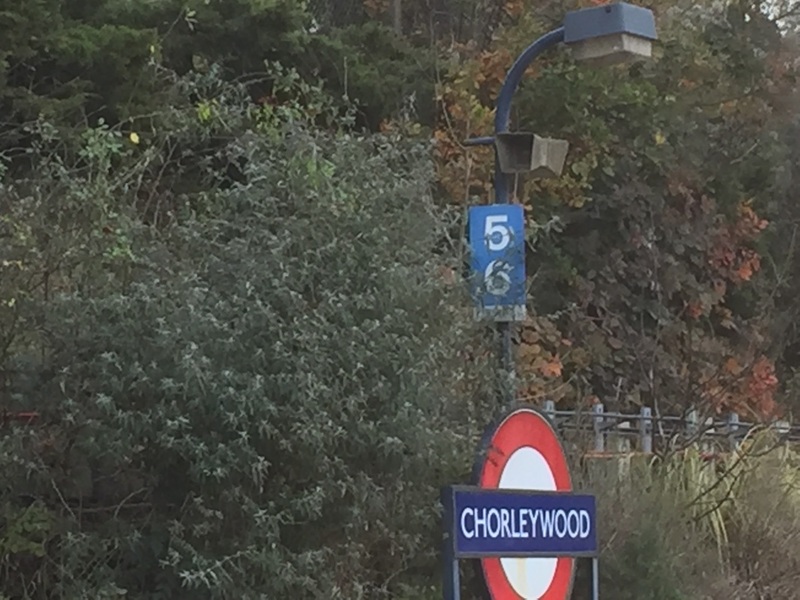 This Chiltern Line / LU Metropolitan Line Station still has a Network SouthEast '5/6 Car stop' sign on the platform. 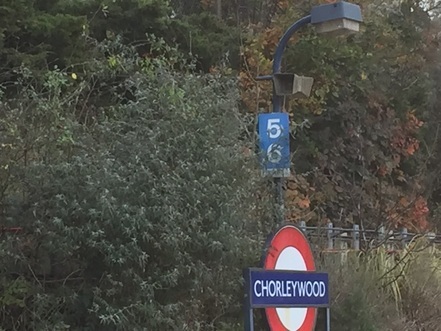 Network Southeast '5/6 Car stop' sign at Chorleywood Station. This station on the Thameslink network is still rich in Network SouthEast features. The Ludgate Hill entrance still greets passengers with NSE signage - minus the NSE flash which is now covered up. 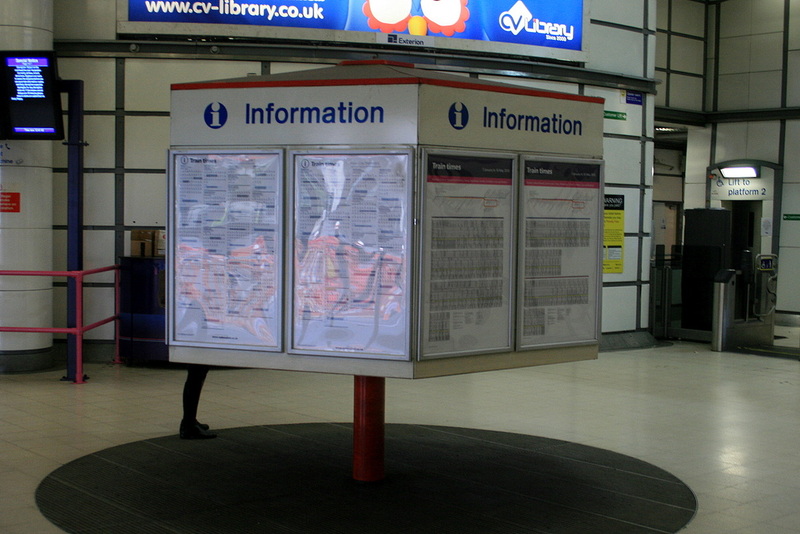 Information / Timetables units still also retain their NSE typeface and red paint. Taken on 10th January 2015. 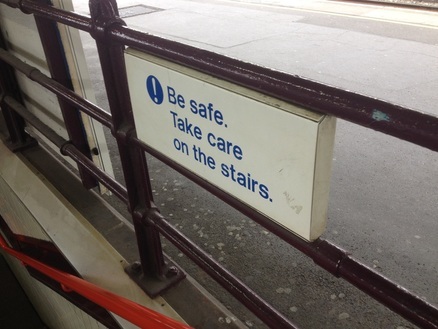 NSE signage with flash covered over at City Thameslink Stn. Ludgate Hill entrance. 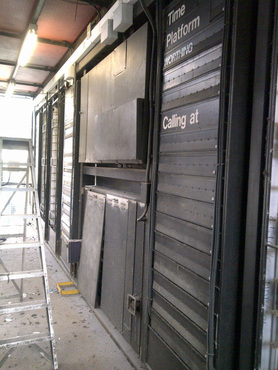 NSE Information / Timetable Unit at Ludgate Hill entrance at City Thameslink Stn. Information & Photos supplied by John Chisholm. in the background is also from the NSE era, further examples can be seen heavily around the station on the walls.Taken on 15th February 2015. 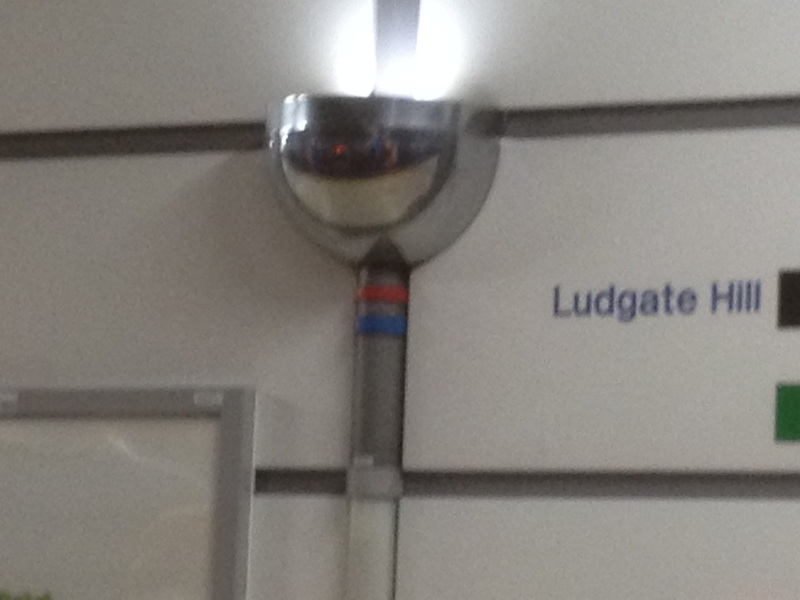 Network SouthEast light fixtures at City Thameslink Station. The passengers subways that run under the platforms that were refurbished during the NSE era, still looking good.. Taken on 13th June 2013. 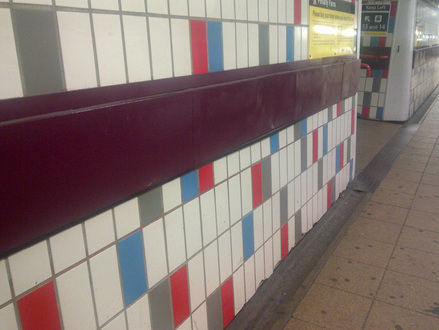 Clapham Junction Station with NSE tiling in subways under platforms. busy interchange station . Taken on 22nd March 2015. 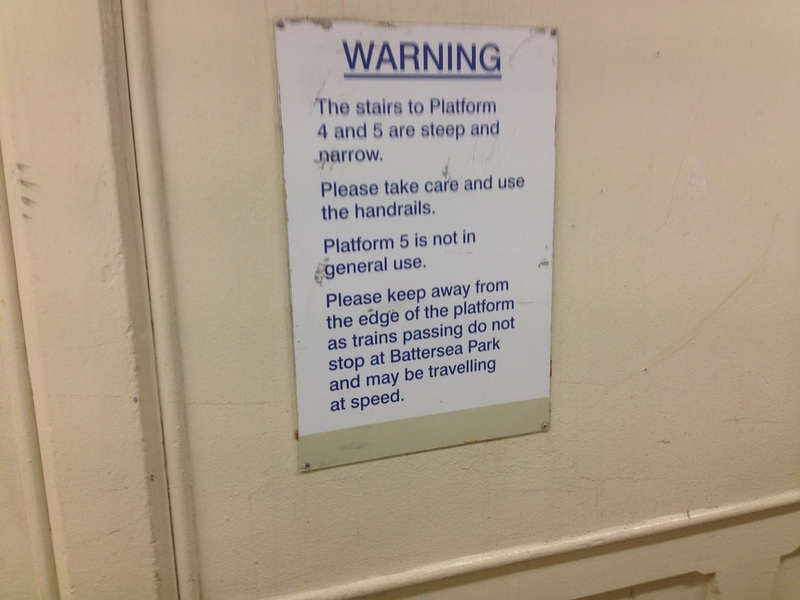 Network SouthEast warning sign regarding stairs at Clapham Junction Station. 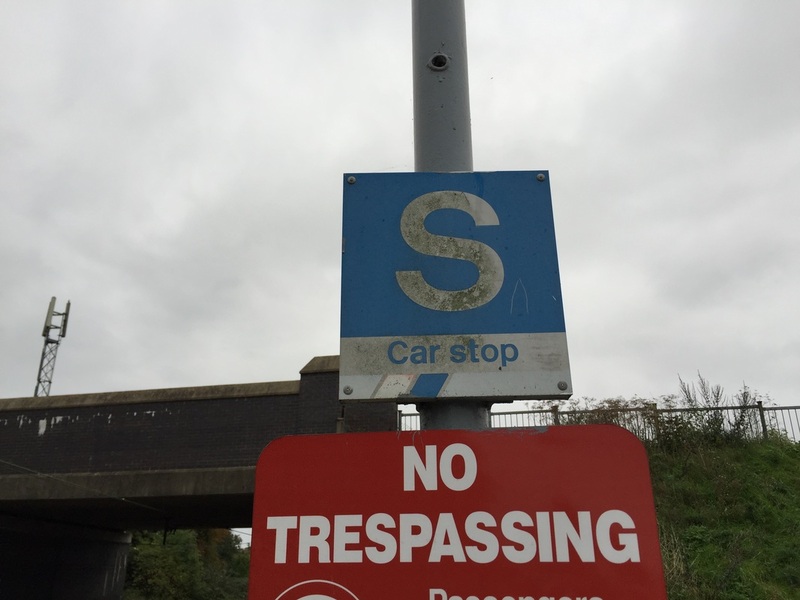 This Essex station still has a NSE branded 'Car stop' signs. 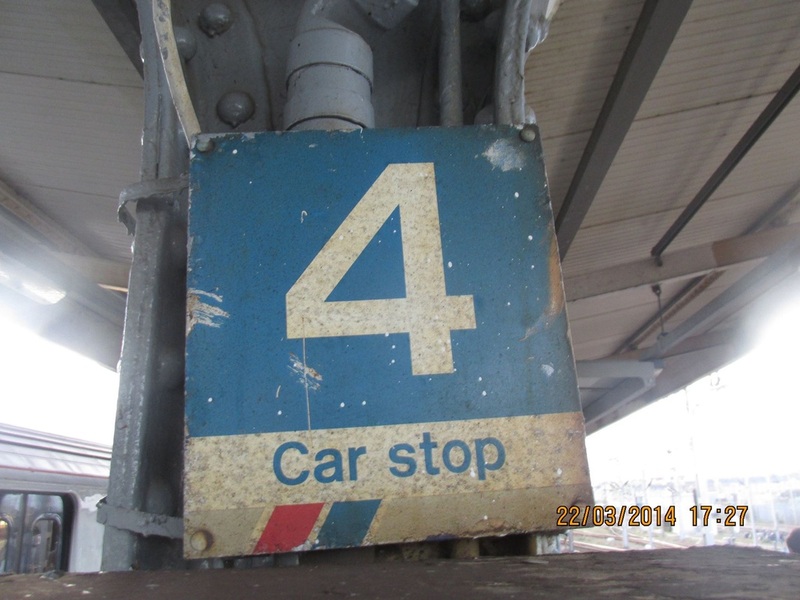 4 Car stop Sign at Colchester Station. 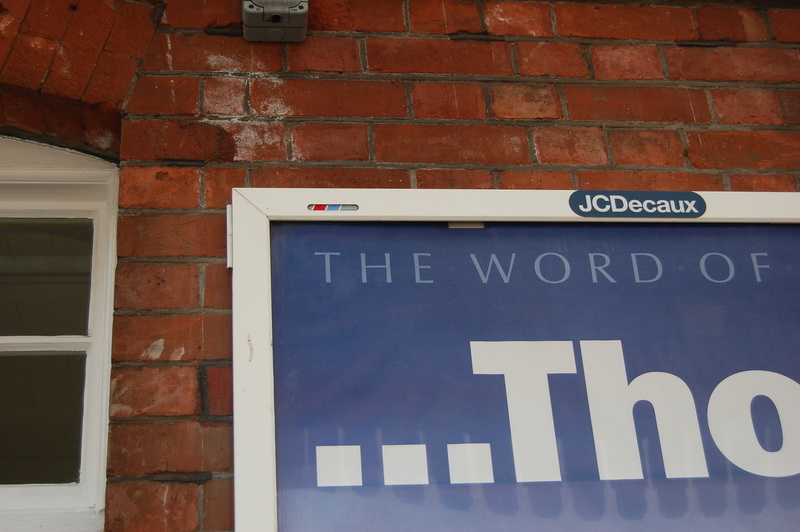 This 'Network SouthEast' branding and door sign is located In the corner in the ticket hall and is not easy to spot unless you look very well. Network SouthEast branding and door sign in Colchester Station ticket hall. 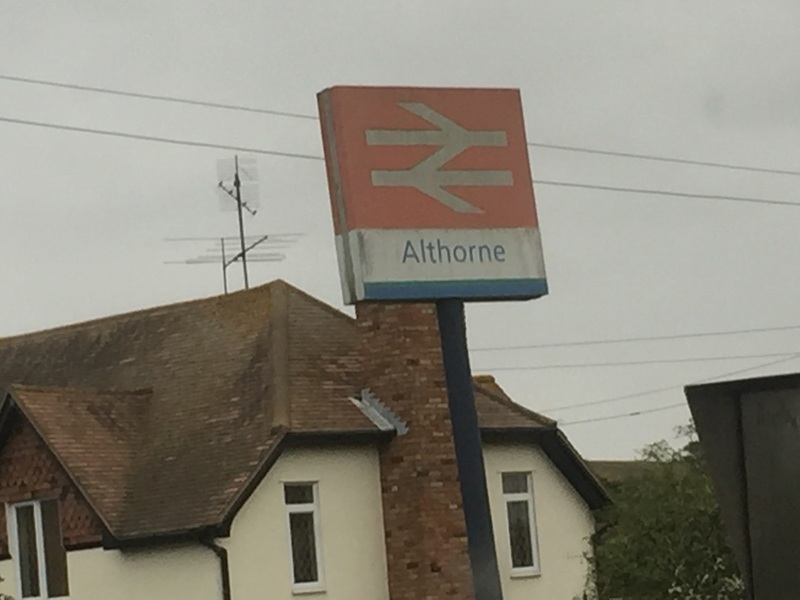 This West Sussex station still has a NSE sign outside proudly stand outside of it. The blanked out section is the former Redstar parcels operation of BR. Taken on 12th February 2014.